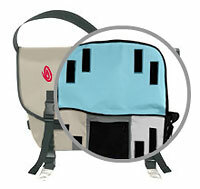 Just click on the box next to the “grab strap” option when you order it at the Timbuk2 website. The handle will cost you $10 extra. Want a center divider? You can order one of those, too. 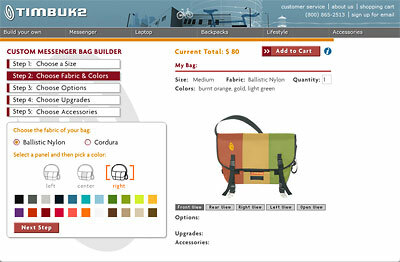 We like Timbuk2’s Custom Messenger Bag Builder. It’s easy to use, it provides a range of choices for building a feature-rich (or feature-poor, if you prefer) man bag, and it doesn’t require any sewing skills. Plus you get to see five different views of your bag as you add and fiddle with options. Timbuk2 offers four sizes to start with, ranging from $70 to $100 for the basic bag. After you decide between ballistic-nylon and Cordura fabric, you can select colors individually for three separate vertical panels on the bag exterior. Be creative: Choose a palette that makes your messenger bag look like the flag of some stylish foreign country, and maybe you’ll hear confused pedestrians mutter comments about immigration or imported fashions as you zoom past them on your bike. Step 3 lets you specify a color for the interior liner. We suggest something bright, unless all your gear glows in the dark — or you simply enjoy the sensual qualities of blind purse fishing. You also get to choose a color for the squiggly Timbuk2 logo, how low you want your reflectors to dangle, and whether you want a right- or left-shouldered bag. Next come the options that cost extra: The “grab strap” handle is only available on the small- and medium-sized bags, but you can get a center divider — actually a pouch with a velcro closure that’s sewn into your bag — on any size. On the next screen, you can add shoulder-strap accessories: a pad in a custom color in any of three fabrics, an accessory case, and a phone holster. Each of these extras costs $10 each, except for the accessory pouch, which is $20, and the phone holster, $15. And then it’s all over, except for the payin’ (and the receivin’, and the wearin’). You can spend up to $155 on a customized courier-style messenger bag from Timbuk2’s nifty Build Your Own Bag site. Which demonstrates an important point: If you want to buy the work of a fashion designer who really has a handle on exactly what you want in a man bag, you’re going to have to pay for it. This entry was posted on Wednesday, May 3rd, 2006 at 7:00 am	and is filed under Courier Bags, Details, Manufacturers, Messenger Bags, Shoulder Bags. You can follow any responses to this entry through the RSS 2.0 feed. You can leave a response, or trackback from your own site.